It seems everywhere I read on social media the message is downsizing and go minimal. Often that isn’t as easy as one hopes. If you have run out of space, here are 7 strategies to maximize your smaller footprint or any footprint. Strategy #1 Edit Your Belongings: Follow our proven and easy to implement 5 Steps to Organizing process to curtail your belongings to what you use and love. One of the easiest, most effective, tricks is to go up rather than out. By utilizing vertical space you save square footage. Strategy #3 Accessibility: Placing drawers inside a closet as a dresser can free-up space in the bedroom. It also keeps all clothing in one central location. You could add wheels to a set of free-standing drawers to make a moveable cart for all types of uses such as a kitchen island and storage of frequently used kitchen tools, craft materials, office supplies, or projects. Use containers that fill a shelf space and different size containers from one container family that are modular and made to fit together. Find a table that can function as a desk and dining table. Get a deep sofa that can double as a guest bed. Buy cubes that can serve as a coffee table. Strategy #6: What’s Behind the Door? 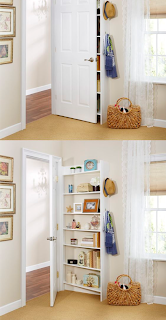 Behind every door is an overlooked and hidden area with big storage potential. To maximize every centimeter you’re paying for, take advantage of the backs of doors in your room for bags, scarves, belts, hats, and more. This tactic also frees up drawer space for other items. Built-ins tailored to your needs can utilize every available sliver of space. When they’re part of the walls, you don’t lose as much valuable square footage. For example, turn a wall into an office or craft space. What ideas do you have for maximizing a smaller footprint? Please share with us!